Nothing can change your life like having a baby to love, care for and cuddle, whether you're the parent, best friend, or relative. So when that baby reaches a milestone, such as a birthday, it is important to celebrate it properly. Many people struggle to find just the right words to express their feelings, so use quotes for inspiration. A first birthday is a big moment in the baby's and the families lives. Celebrate that moment by using a special quote. These first birthday quotes can be used for either a little boy or girl. What a celebration your first year has been! Many wishes for love, happiness, and all things good in every year to follow. You've brought a year of happiness to all who know you. Wishing you a day of smashed cake, lots of presents, and another year of joy. Thank you for letting us celebrate your first year of life. Sending you hopes for joy and happiness on this year special day. Happy birthday to the sweetest, smartest, funniest, most loving one-year-old I know. Have an amazing day celebrating YOU! Though you have only been on this Earth for a year, your life has made a big impact on so many. Have a happy birthday and many wishes for a wonderful year. Twinkle, twinkle little star, a year one old is what you are! It's an extra special day, becuase a very special baby has a birthday. Use these sayings to celebrate a baby boy's birthday. Here's to a year of snips, snails, puppy dog tails, and a lifetime of adventure. Boy, Oh, Boy! Look who is turning one! Consider these sayings for a little girl's birthday. Ruffles and lace and everything pink, Her first year was over before we could blink. The road ahead promises to be, As perfect and pretty as she. It's only been a year year with our little girl, but someone she managed to get into our hearts with just a swirl and twirl. Happy birthday to a beautiful little girl who has danced and spun and giggled her way into the hearts of many. Celebrate your twins' birthdays with a special quote. Twins (Boys) - Double the trouble and twice the fun! So glad that our favorite boys have turned one. Twins (Girls) - Sugar and fluff and a little spice. Giggles and smiles and all that is nice. Pink and ruffles, lace and pearls. We are so blessed by knowing these two little girls. Now its time for gifts and cake and memories made for a celebration of a year of life that we'd never trade. Twins (Boy and girl) - Wishing you double the cake, twice the fun, and two times the joy, to an amazing girl and wonderful boy. Check out these quotes from parents on a baby's birthday. A year of giggles, hugs, and sleepless nights. A year of first steps, first words, and new sights. A magical journey full of surprises and fun, our favorite baby is about to turn one! Every day of your life you have been a blessing. Just when I didn't think you could get cuter, funnier or smarter, you someone managed to do it. On your birthday, I wish you everything your heart desires and more. Life has been sweeter, more adventurous, and a ton more fun since you've been in it. Birthday blessings to my precious child. Blessings to you, little one, on your special birthday. Parents who adopted their children may want to recognize it with a special quote, like "You may not have my eyes or smile, but on this special birthday, I want you to know that you've had my heart from the moment I met you." If you still need inspriation, try the following other sources for birthday quotes. Wishes Quotes - Parents and friends can use this source of 12 quotes for a baby's birthday, whether it's the first or another year. 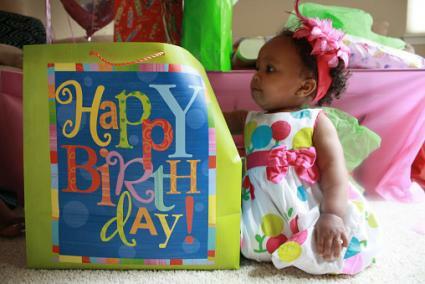 BirthdayMessages.com - Check out these 15 birthday messages geared towards babies and other youngsters. What to Write in a Card - Just as their site name indicates, this site will help you figure out an appropriate verse to write in a birthday card. Some are geared towards slightly older kids, but you can still find good options for babies among the choices on five pages. Wish a Friend - This site has four pages of longer quotes and verses specifically written for children on their birthdays; you'll need to search through the pages to find the ones appropriate for a baby's birthday. Birthday Wishes for Children - Pick from quotable sentences or verses that are appropriate for a baby or child's birthday. Two pages have quotes geared towards the various ages mixed together, so read through them all before you make your final decision. Incorporate the quotes, sayings, and poems into the birthday celebration in a variety of ways. Celebrate a year of life and love with our precious little gift from above! Come and join the fun! Our baby boy/girl is turning one. Use the quote on the front of the invitation, as part of the design, on the interior as part of the verse, or as an insert. If you're creating a scrapbook of the child's birthday, use a verse or two on the pages to help convey your thoughts and feelings. Simply copy and paste or type your favorite verse on your computer and print it out on acid-free paper to use in your layout. Create a birthday card to give to at a birthday party by incorporating a meaningful quote. A homemade card can be a wonderful accompaniment with a gift or can be used as a way to give money. Use your favorite quote to decorate a wood plaque or needlepoint to give as a gift for the birthday baby. This will act as a keepsake that the child can display for many years. In addition to using these quotes in the tangible ways above, consider using them in a speech given at a birthday party. You can also use them in a letter written for the birthday child or as a part of a video or photo slideshow made to show at the party. No matter how you choose to use your favorite quote, a quote can be the perfect way to help convey your emotions for the child. Customize the quote to suit the baby in your life.